Dr. Paul E. Hund received his bachelor's degree in Chemistry from the University of Kansas prior to attending the U.M.K.C. School of Dentistry. He obtained his D.D.S. (Doctor of Dental Surgery) and completed a Hospital Residency from the V.A. Medical Center in Leavenworth. Dr. Hund enjoys all phases of general dentistry but has a special interest in oral surgery and I.V. sedations. Dr. Hund has been very active in state and national dental organizations. 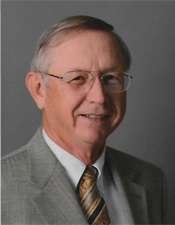 He holds memberships in the American Dental Association, the Kansas Dental Association (Past President), the Kansas Academy of General Dentistry (Past President), the International College of Dentistry, and the American Society of Dental Anesthesiology. Community involvement has included serving as a board member for numerous local and civic organizations and church activities. Dr. Hund and his wife, Doris, are the parents of four children. He enjoys hunting, fishing, and golf.